Even now, we crave for stories. We need creative ways to express ourselves in order to keep the magic happen – if it’s not too much to say, your own life storyline. Fortunately, this courage took shape in different art environments and even advertising. The fact is the unicorn is so alive in our lifes that we live under the impression that he’s an omnipresent entity. He simply exists. And often, he takes a look at us. Below, an overview of works in which this honorable creature honored us with their presence. 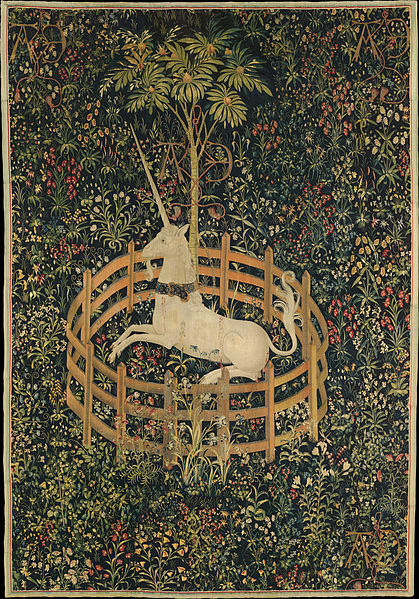 First, we go on 19th Street in Manhattan, to the Cloisters Museum, where an exceptional collection of seven tapestries, “Unicorn tapestries’, draws viewers in the story of hunting, capturing and ultimately killing the Unicorn. It’s probably the most complex and beautiful work of art from the medieval period that had withstood time. Opulent de facto – woven with silver wool, silk threads with colorful and natural symbols like weld or madder flowers – these works seem to symbolize in a special way the sufferings of Jesus Christ and the reason of marriage. The works were donated by John D. Rockefeller, who previously had purchased them for more than $ 1 million in 1922. Fortunately, although initially the tapestries had been used to cover sacks of potatoes during the French Revolution, these works of “an incomparable grace and freshness ” have been preserved over the centuries. PHOTO Unicorn in captivity (1495-1505) a powerful creature, delicate and pure. 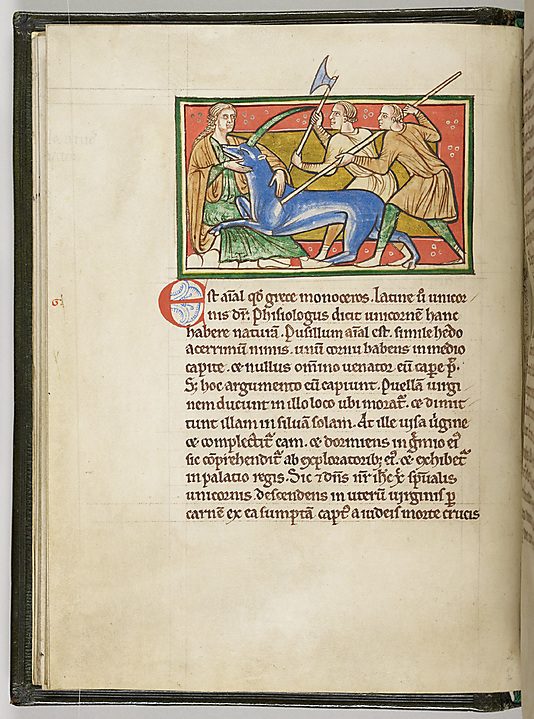 It is believed that here, it illustrates the “tamed” lover. It is tied by a chain of which can easily escape, closed in the middle of a wooden fence over which it can jump. 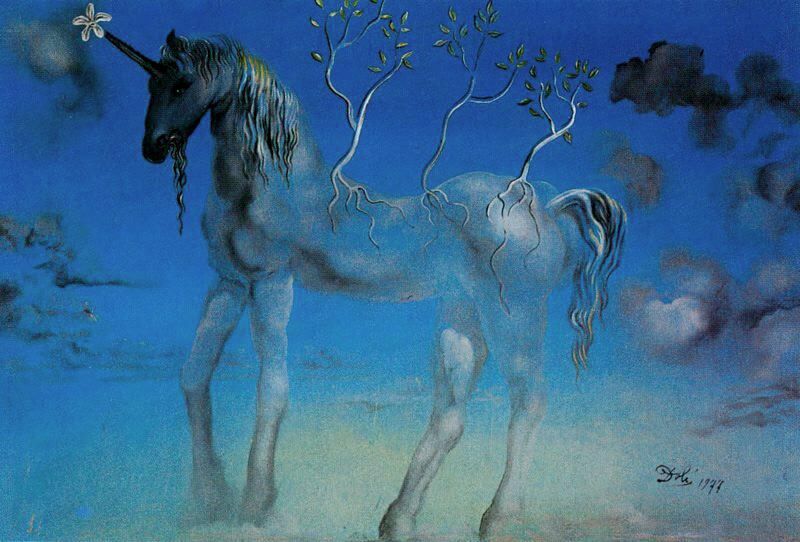 The unicorn can save himself, but assumed constraint is a happy one – an idea suggested by pomegranate tree full of seeds, medieval symbol of marriage and fertility. Many of the plants illustrated – Orchid, thistles – were considered fertility incentives. In the National Library of Medicine from the States there is a history of general medicines’s page, printed in Paris in 1694, as a result of the belief that the unicorn horn was considered a universal panacea. PHOTO anonymous engravings, text written by Pierre Pomet, Histoire generale des drogues. 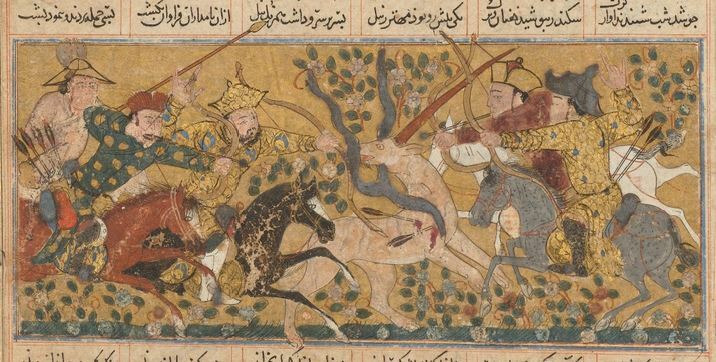 The Department of Medieval Islamic Art has an illustration from the 1300s, with Alexander the Great fighting a monster: Habash, a mythical creature belonging to Ethiopia – perhaps a relative of the rhinoceros. 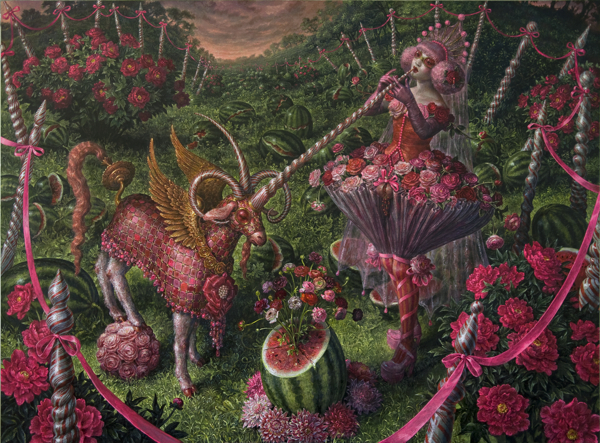 For once, the unicorn is not captured by hunters: in Hebrew art! He appears in manuscripts, in settings of synagogues or on religious objects. Hebrew artists claim that is the symbol of their own curse, saying that “the unicorn hunting represent the Hebrew people who are suffering caused by the Messiah, not the suffering of Jesus” – as Michael Epstein Marc says, author of Dreams of Subversion in Medieval Jewish Art and Literature. 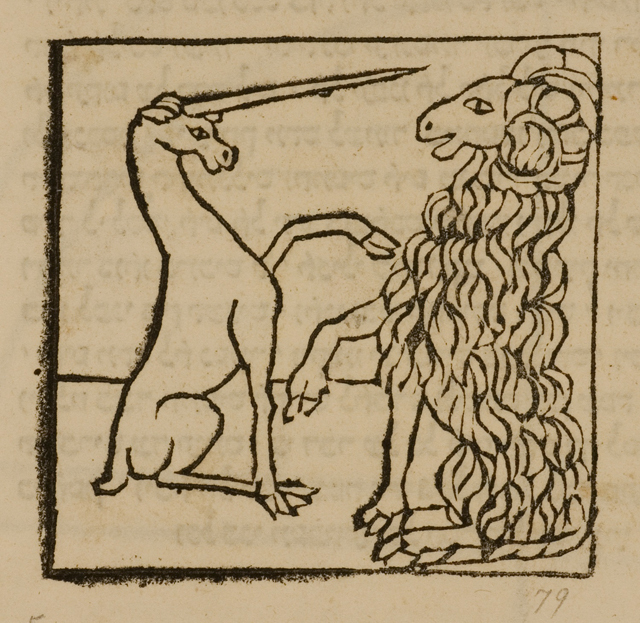 PHOTO anonymous engraving from 1491, printed by Gershom ben Moses Soncino, Unicorn and Ram in Fable of the Ancients. Legend has it that the unicorn was hiding from people and he could only be seen in shady areas like virgin forests. Only virgins could observe and tame it. Therefore, hunters were using her to catch the creature, which is taught in the arms of the Virgin. Miraculous powers unicorn horn and powerful in itself makes it so rare and appreciated. Panacea for infertility, unicorn horn has numerous interpretations of sexuality, but that debate in another story. Even the famous Da Vinci was touched by the charm of the story of this mysterious animal in his youth. Proof is an outline ink of a virgin who tames a licorn, dating from the 15th century. “For the love it bears to fair maidens, the unicorn forgets its ferocity and wildness and laying aside all fear it will go to a seated damsel and sleep in her lap, and thus the hunters take it”, he wrote. Although the sketch should have been precede a painting, none was made, unfortunately. Copyright © 2019 MageLine Web Development. All rights reserved.